I was surprised to find out about the status of this plant according to the IUCN, considering the fact that I just saw about 50 of these plants available for sale in the nursery section of the local grocery store. 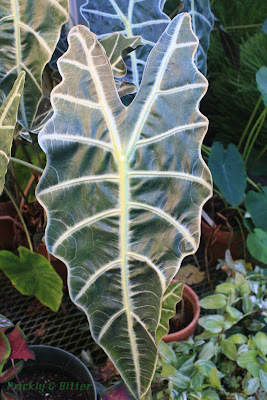 The kris plant, named that way because the edge of the leaf is reminiscent of the blade of the kalis dagger (also known as a kris), is native to the Philippines where it is listed as critically endangered. Despite this, it is sold by the thousand every year as an ornamental plant. 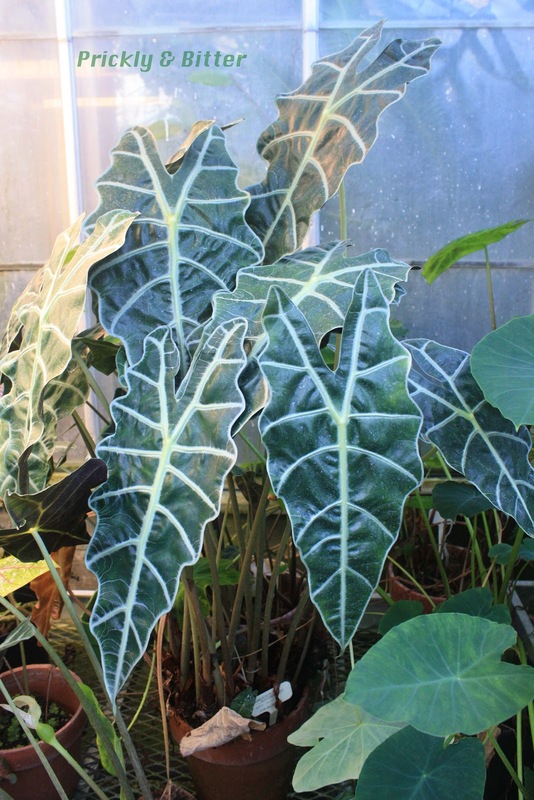 It is now rarely harvested from the wild (still done in some places despite it being against international sanctions imposed by the IUCN, and the trade of this plant from the Philippines to the rest of the world is illegal), and commonly grown in greenhouses. As with other tropical house plants, make sure you know the origin of the plant (not just the company that ships it, but where they got the original stock from to grow the plant!) before buying. If the company can't tell you where they get their plant material from for whatever reason, don't buy it! There are a few programs in place for the conservation of this species, but only indirectly. What I mean by this is that there are ecosystem-wide conservation efforts currently underway in the Philippines (some restoration efforts as a result of recent typhoon and tsunamis), but none specifically focus on the status of this particular species. Other than having incredibly attractive leaves, it has no known use to humans (it is not edible like its close relative, the taro) so this probably contributes in part to the lack of attention paid to it. It is, thankfully, quite common in one of the most well protected national parks in the Philippines, so for now it is unlikely to go extinct in the wild (unless a tsunami rips through the area...). A replanting effort would also be a good start! I've never been to the Philippines so I've never seen them for myself in the wild, but apparently they can grow to be over 6 feet tall. That's a single leaf, six feet off the ground. It would be like an umbrella! The flower of the kris plant is the characteristic flower of the Araceae, or the arum family. 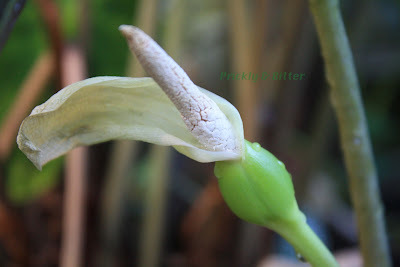 It has the greenish-white spathe surrounding the inflorescence, and the white spadix that contains the separate male and female flowers. In this particular inflorescence, the male flowers are at the top to be better exposed to the wind to blow the pollen to a neighbouring plant, and the female flowers are near the base of the spadix, where the spathe can catch the pollen and transfer it to the spadix. Not all spadices (spadixes? Spadii?) are arranged that way; some are only male or only female, some are completely bisexual but only either the male or the female flower parts are active at any one time, and sometimes both male and female parts on the same flower are active all the time. The base of the petioles (or the "leaf stalk") are attached to the ground-level stem, in this case a rhizome. Many species of this genus and closely related genera have a specialized structure called a corm; these are very similar to bulbs, but instead of having fleshy leaves as a storage organ, it's the stem itself that's fleshy to store starch and sugars. This is the case in taro, which is widely eaten (taro chips are fantastic, and the Hawaiians make a special dish out of taro called poi). 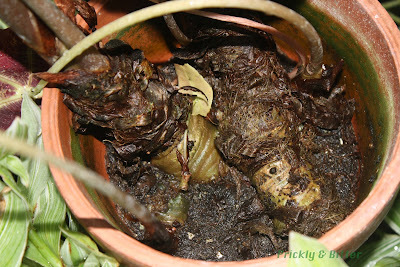 Another plant with a corm that would kill you if you ate it would be the hyacinth (which you can read all about HERE).